We are service provider of Acrylic Fiber Waste Recycling, Blanket Wash Recycling, Acrylic Textile Waste Recycling. Shimi Research Center Private Limited is the only company in the world till date to provide Acrylic Fibre Waste Recycling Technology/Expertise. We provide all the necessary technical know-how on processing acrylic fibre waste to grey Polyacrylonitrile, PAN polymer so that it can be used as the raw material for acrylic fibre manufacturing, without any changes in the physical and chemical properties. The process is carried out in an environment friendly manner. Acrylic off grade soft and hard waste, etc. These wastes find their market in Asian countries, where they are subjected to manual separation and production of yarn either in the actual form or blending with other fibre. The acrylic fibre wastes also find application in manufacturing of acrylic base adhesives and paints. The global demands for synthetic fibre and higher cost of acrylic fibres in compare to polyester fibre require measures to minimize the waste and reduce the production cost. In our patented technology, the acrylic fibre wastes in any form are converted to PAN polymer which could be easily mixed with the virgin pulverized PAN and introduced in manufacturing process, minimizing the waste generation and reducing the production cost. The incorporation of Blanket Wash Recycling minimizes the waste generated during the washing process and reduces the cost by 35-40% without compromising the quality and performance of the wash. we recover the waste ink given by the client and remove all the ink,water in the ink. What is Wash: Wash is a mixture of selected solvents used to remove ink and other impurities from blanket and rollers of printing machines Recent multi-coloured machines are equipped with Automatic Washup Systems. These systems initiate a process in which wash and water are sprayed on blanket and rollers and cleaning is done by brushing system. The waste generated from this process is automatically drained and collected in containers. Washes come in several varieties. Good grade washes are environment friendly and preserve the properties of rollers and blankets. They are, less hazardous than low grade washes and have less VOC (Volatile Organic Compound). 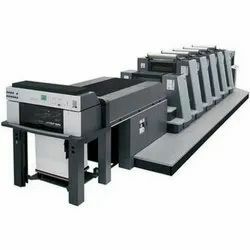 It is due to these advantages, that all leading printing houses invest considerable amount of money in buying good quality wash for their machinery. Can you Re-Use The Spent Wash: Shimi Research Center has designed a novel process in which spent wash can be recycled. Through this process the impurities present in the spent wash are removed using absorption and microfiltration to ensure the integrity of the original wash. No heating and distillation process is used. The Recovery of wash is in the range of 90-95% depending on the type of wash used. This in turn gives you a saving of upto 35% of your regular expenditure on buying wash.
No pollution related problems to the customer. Pickup and drop-off service at your location. Price of recycled wash less than market price. Shimi Research Center Private Limited is the only company in the world till date to provide Acrylic Textile Waste Recycling Technology/Expertise. 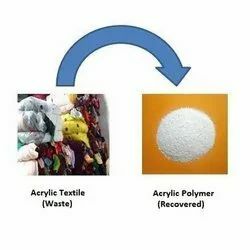 We provide all the necessary technical know-how on ways to remove the colour and recycle the acrylic textile/fibre waste to Polyacrylonitrile, PAN which can be used as the raw material in the Acrylic Fibre manufacturing process. This is process provides a low cost raw material and ensures a competitive edge in the synthetic fibre market. Textile recycling is for both, environmental and economic benefits. It avoids many polluting and energy intensive processes that are used to make textiles from fresh materials. The requirement of landfill space is reduced. Textile waste lead to many problems in landfill. Synthetic fibres don't decompose. Pressure on fresh resources is extensively reduced. Leads to higher profitability as we use lower cost raw material. As fibres get locally available, they don't have to be transported from abroad thus reducing transportation cost and increasing profit. Majority of textile waste comes from household sources. Average lifetime of any clothing is deemed to be for about 3 years, after which, they are thrown away as old clothes. Sometimes even 'not so worn garments' are also discarded as they become unfashionable, or undesirable. 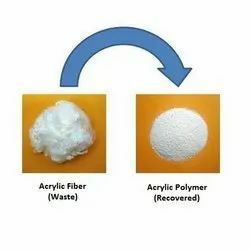 The conventional approach to reuse the acrylic textile waste is manual separation and production of yarn either in the actual form or blending with other fibres.